1. Turn the ignition switch to LOCK . Turn headlights and all accessories off. 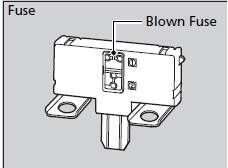 - If the fuse is blown, use a Phillips-head screwdriver to remove the screw and replace it with a new one. 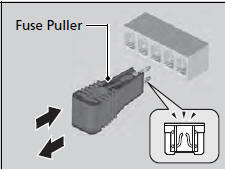 - If there is a burned out fuse, remove it with the fuse puller and replace it with a new one. 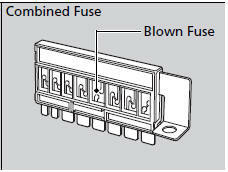 Replacing a fuse with one that has a higher rating greatly increases the chances of damaging the electrical system. If you do not have a replacement fuse with the proper rating for the circuit, install one with a lower rating. There is a fuse puller on the back of the engine compartment fuse box.